Municipal official unveiled the sign at 764 11th Avenue last Tuesday. Thomas was moved by the tribute. Tim Thomas (left) with school board member Emanuel Capers (right). “This is amazing. I’ve had a lot of great days in my life and this is one of them,” said Thomas, his voice breaking. Thomas, a native son, graduated from Paterson Catholic High School. He was rated as a top player and viewed as a future professional basketball stars while in high school. He was selected to the McDonald’s All-American team after averaging 25.3 points and 14.5 rebounds per game as a senior. After his freshman year at Villanova University, Thomas was drafted by the New Jersey Nets in 1997 and immediately traded to the Philadelphia 76ers. He had a solid rookie season averaging 11.0 points per game and was recognized as a top rookie. Thomas played in the National Basketball Association (NBA) for 13 years. He played for the Milwaukee Bucks, New York Knicks, Chicago Bulls, Phoenix Suns, Los Angeles Clippers, and Dallas Mavericks. 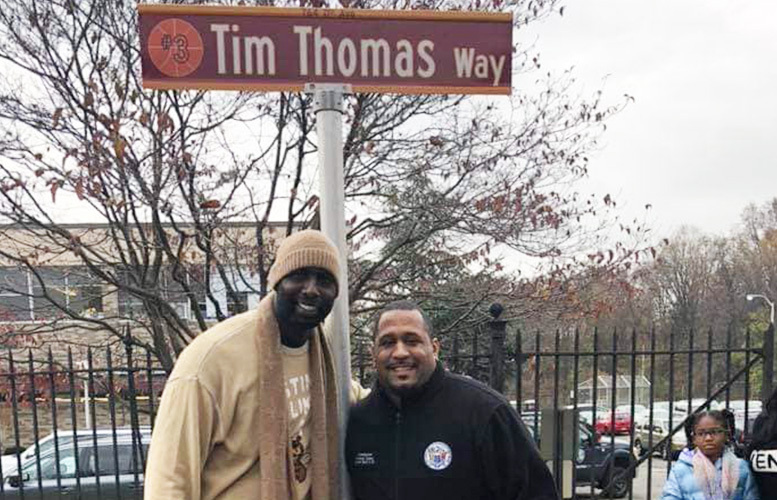 The resolution designating the street in Thomas’ honor says he is “one of the best basketball players from New Jersey.” It also states, Thomas “never” forgot his hometown. He was a major donor to the former Paterson Catholic High School, the city’s recreation program, the Paterson AAU Basketball programs, and the Paterson Youth Football League. Thomas’ contribution “exceeded $1 million,” says the resolution sponsored by councilman William McKoy and former councilman Kenneth Morris. He provided scholarships to local young people to attend private high schools and colleges. Some council members were ostensibly excluded from the ceremony. “Not to be there and show my full support for him is a disappointment,” said Michael Jackson, 1st Ward councilman. Jackson, Davila, Shahin Khalique, and William McKoy claimed the mayor did not send them invitations to the ceremony. The mayor’s chief of staff sent an email to all council members on Monday morning inviting them to the ceremony. The ceremony is scheduled at 9 a.m. on Tuesday, read the email. “We can’t say nothing was sent. We can say it was sent too late. Something was sent,” said Mimms. McKoy and Davila later said the notice was sent too late to allow council members, many of whom have day jobs, to attend the ceremony. Davila said the administration should have called council members.